It happens only once in the whole year, and that day is on Black Friday!! What happens?? 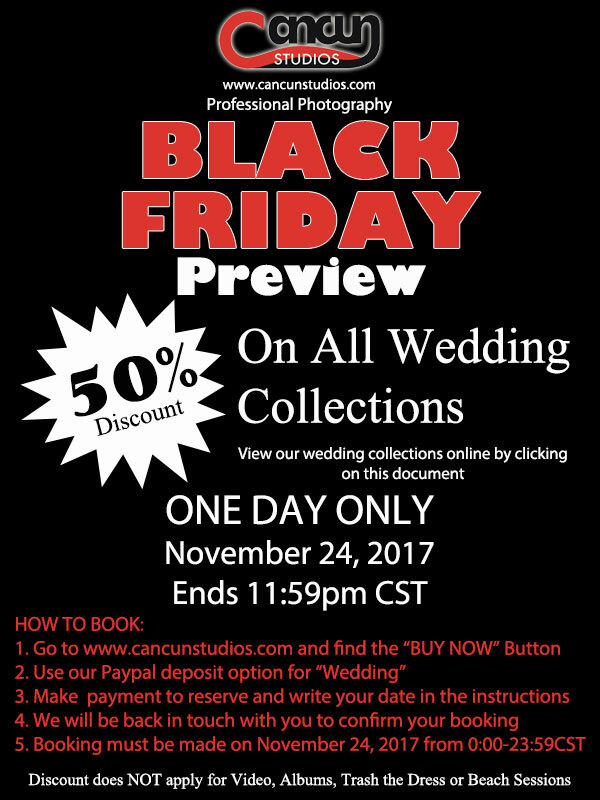 Our Cancun Wedding Photography is available at 50% OFF. That means, all of our Wedding Collections are 50% off. So take advantage and write the date on your calendars. Don’t miss out…you can only get this discount on November 24, 2017. Plan ahead and choose your PACKAGE. Need help? Use our handy GUIDELINE to select the correct amount of coverage. Need more information about our Cancun Wedding Photography, call us today toll free 1-888-215-0428 or to our local number 01152-998-310-3224 or shoot us a text or whatsapp to our cell phone at 01152-998-845-0533. We are ready to answer your questions! Follow the simple instructions and book at our WEBSITE. Happy Shopping!